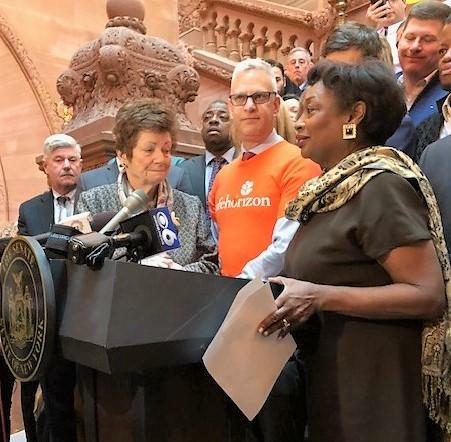 Senate Leader Andrea Stewart-Cousins, at right, speaks at a rally for survivors of childhood sexual abuse, along with Michael Polenberg (orange shirt) of Safe Horizons and former State Assemblywoman Margaret Markey, who was the original sponsor of the bill in the Assembly. Victims of abuse in Central New York and across the state might find solace in the new Child Victims Act that was passed in the state legislature today. Up until this point, the statute of limitations on a sexual abuse crime ran out when the victim turned 23. Monday, that age was increased to 55 for a civil statute and 28 for a criminal statute. The State Legislature passed the Child Victims Act on Monday which extends the statute of limitations on childhood sexual abuse. Survivor Brian Toale says this is a much-needed change of pace. The act will also include a ‘look-back’ period for victims whose statute of limitations has run out, but who would like to file a civil lawsuit. Vice President of Government Affairs at Safe Horizon Michael Polenberg knows this is important for survivors across the state. Polenberg is quick to note that the bill does not give the victim an advantage in the proceedings; they will still need to provide appropriate evidence in order to win their case. However, the act opens the door for victims whose previous options were to live without justice for their abuse. Brian Toale hopes the act will change the way in which the government looks at sexual abuse cases. Toale says in the past, abusers were not named in settlements reached in court. Click here for more on the Child Victims Act. A bill that would give victims of child sexual assault a window to bring old cases against their abusers is stalled in Albany. A group advocating for the Child Victims Act is raising awareness about the measure in hopes of countering opponents of the bill … and perhaps making New York safer for kids. Advocates who want the Child Victims Act passed in New York are stepping up the pressure on Republicans in the State Senate. Some GOP Senators are the final hold outs against a bill that would extend the statute of limitations and open up a one year window for past victims to file civil lawsuits. The measure would allow someone to take court action up until the victim is the age of 50. The current age limit is 23.